Cloudland Rooftop, 12th floor, 641 Ann St, Fortitude Valley, Brisbane 4006. +61 7 3872 6600. The three level, 1500-capacity venue boasts a fully retractable roof and rooftop bar. Katarzyna Club Level 12 Rooftop. Bar Mon & Tues 5pm–late. Wed to Sun 11.30am–late. Restaurant Mon & Tues 5pm–10pm. Wed to Sun 11.30am-10pm. Rydges South Bank Hotel, 12th floor, 9 Glenelg Street, South Bank, Brisbane 4101. +61 7 3364 0800. 4th Floor, Level 4, 77 The Esplanade, Mooloolaba, Queensland. +61 7 5477 7844. Sunshine Coast. Breathtaking views from Point Cartwright to Noosa. 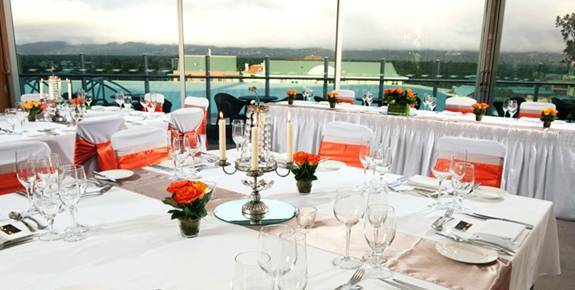 Four Winds Revolving Rooftop Restaurant, Crowne Plaza Hotel, 2807 Gold Coast Hwy, Gold Coast, Queensland 4217. +61 7 5592 9907. Lunch & dinner 7 days a week and breakfast on Sundays. Dinner: Sunset sitting from 5.30pm to 7.30pm. Candlelight sitting from 8pm to 10pm (10.30pm on Friday & Saturday). Atlantic Tower Motor Inn, 10th floor view, 760 Anzac Hwy, Adelaide. +61 8 8294 1011. Loft Lounge, The Maid and Magpie Hotel, 1 Magill Road, Stepney, Adelaide, SA 5069. +61 8 8362 6053. Great city views. Outdoor seating area. Mon to Sat 9am-3am. Sun 9am-12 midnight. 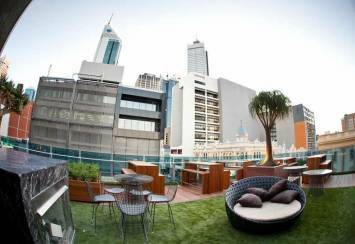 Nadine Function Rooms, Majestic Hotel Roof Garden, 55 Frome St, Adelaide 5000, Australia. +61 8 8100 4499. Roof garden with views. The Gallery on Waymouth, 30 Waymouth St, Adelaide, SA 5000. +61 8 8211 820. Rocket Bar Rooftop, 142 Hindley St, Adelaide, South Australia 5000. +61 8 8232 3030 Thurs to Sat 9pm-5am. 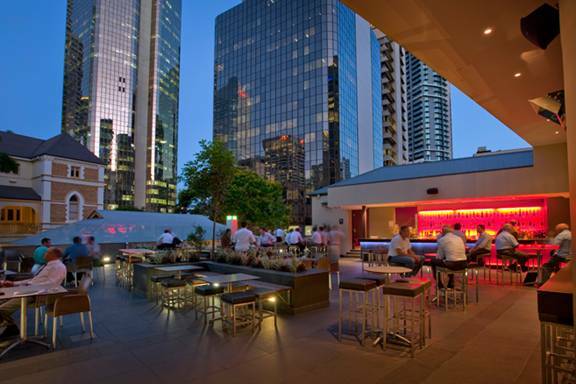 Conservatory Rooftop Bar, 356 Murray St, (Prince Lane Entrance), Perth, WA 6000. +61 8 9481 1960 Open air lawn with good views of the city. Tues 12 noon-9pm. Wed & Thurs 12 noon-1am. Fri & Sat 12 noon-3am Sun 12 noon-9pm. Mon by arrangement. Eco chic. 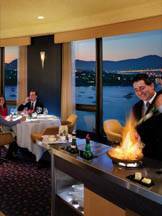 The Point Revolving Restaurant, 17th floor, Wrest Point Casino, 410 Sandy Bay Rd, Hobart. +61 3 6221 1700. Breathtaking views. 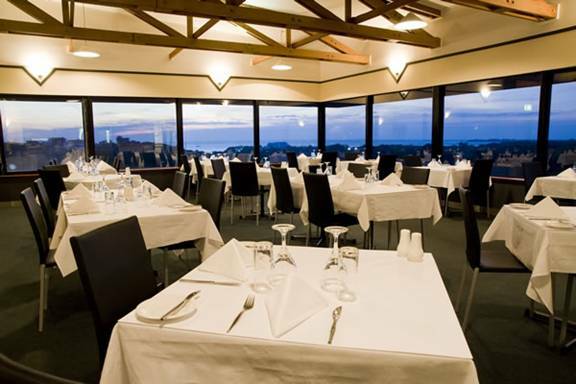 Rooftop Restaurant, 7th floor, Quality Hotel Frontier Darwin Hotel, 3 Buffalo Court, Darwin. +61 8 8981 5333. Great 270-degree views of the Darwin's skyline. 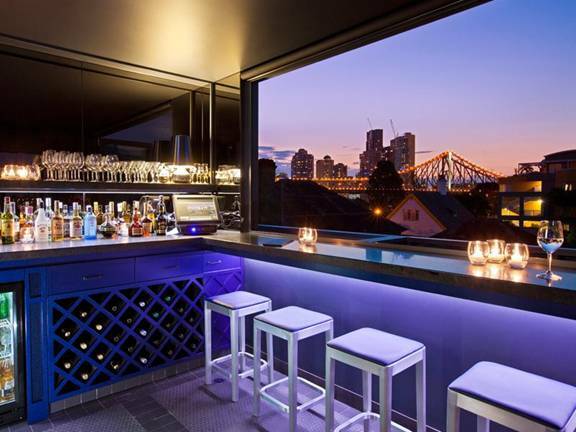 The Terrace Bar, 529 Hunter Street, Newcastle, NSW 2300. On the second floor and boasting one of the city's few rooftop beer gardens.